A number of Philae's features can be made out in this image taken by Rosetta's OSIRIS narrow-angle camera image on 2 September 2016. The images were taken from a distance of 2.7 km, and have a scale of about 5 cm/pixel. Philae's 1 m wide body and two of its three legs can be seen extended from the body. 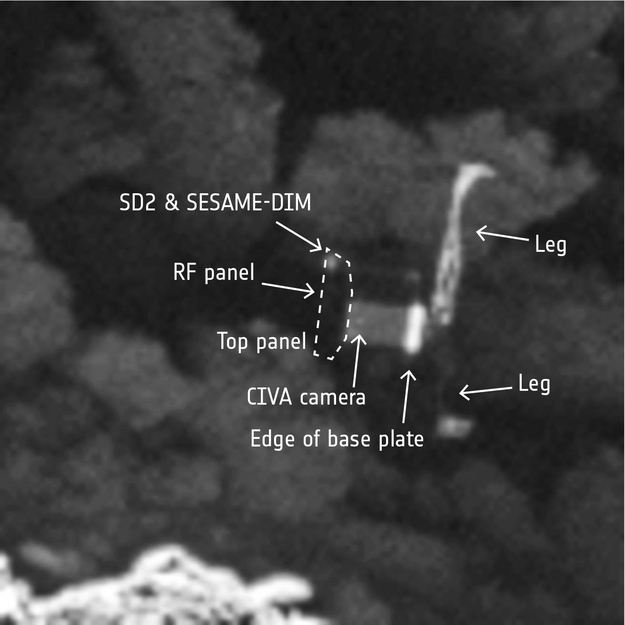 Several of the lander's instruments are also identified, including one of the CIVA panoramic imaging cameras, the SD2 drill and SESAME-DIM (Surface Electric Sounding and Acoustic Monitoring Experiment Dust Impact Monitor).